Vacation rental house. Sleeps 5, 3 bedrooms, 1 bathroom. No pets allowed. Welcome to this beautiful home on over 40 acres. 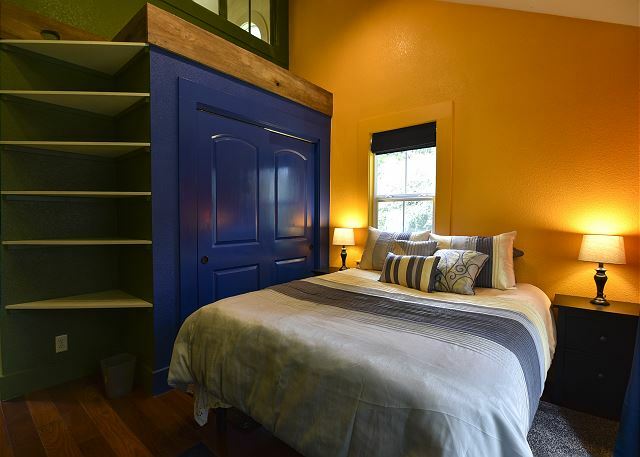 Brightly colored walls accented with recycled wood adds a cheerful style to this 3rd bedroom. Entertainment area with french doors leading into front Sleeping Room. Fully equipped kitchen with warm wood cabinets and stone countertops. 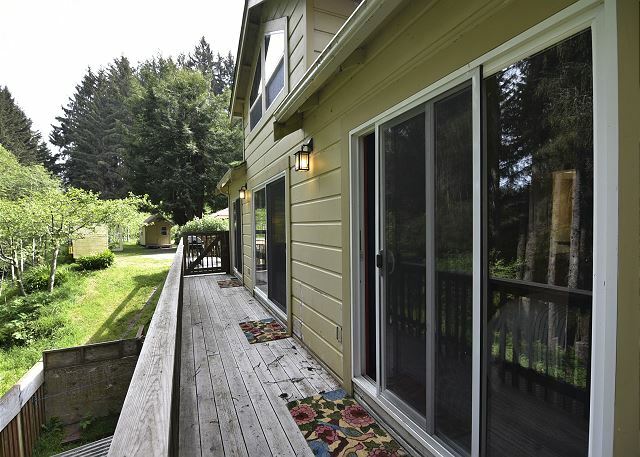 All bedrooms open to wrap around deck overlooking the woods. Dine in style surrounded by nature. Wrap around deck seats up to 10. 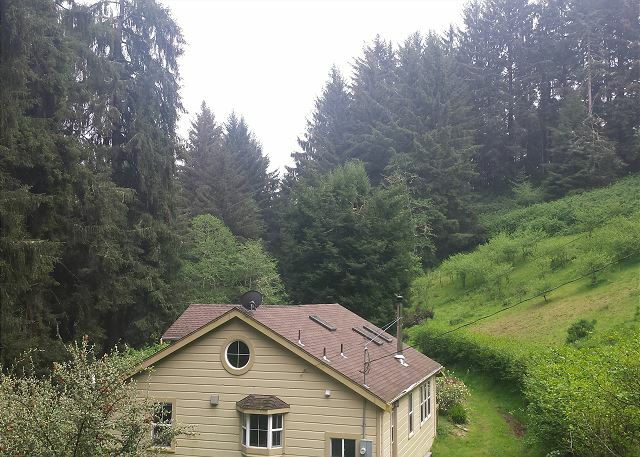 The home is up in the hills and surrounded by redwoods. Take a hike on many of the walking trails found on the property. 10 minute ride to park. Newly restored cabin in the redwoods. 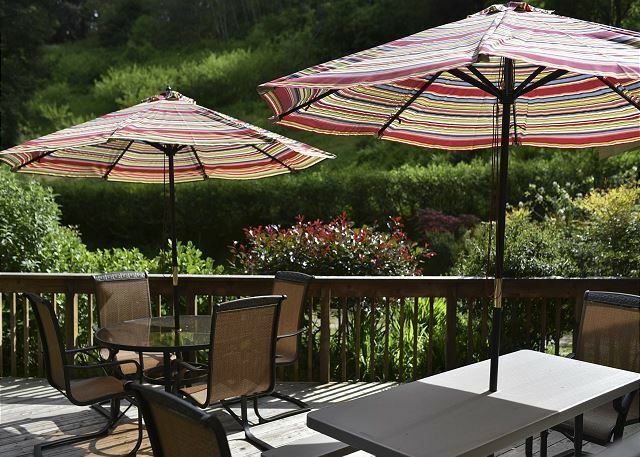 Enjoy the convenience of cooking on the outdoor gas grill or just relax beneath the patio umbrellas. Seats up to 10 people. 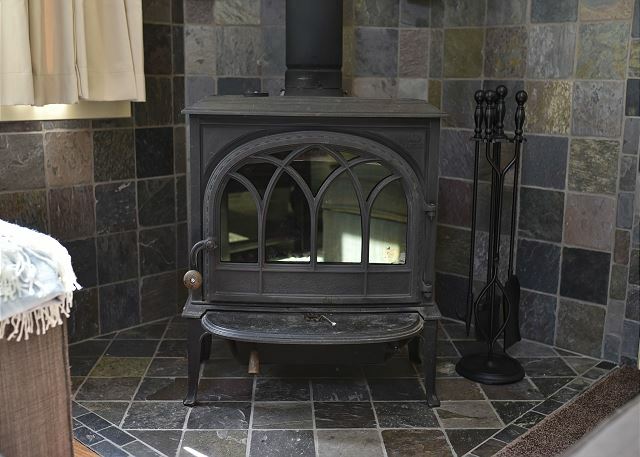 The shed is always stocked to keep the wood stove burning. 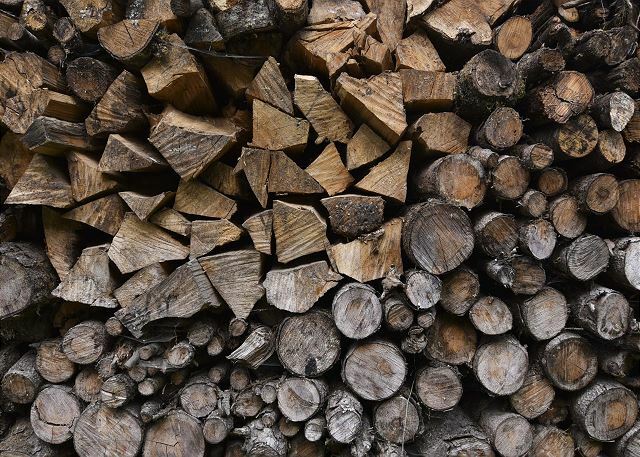 A complimentary wood bundle and kindling is provided for every guest stay. All three bedrooms have sliding doors that open up to the wrap around deck. 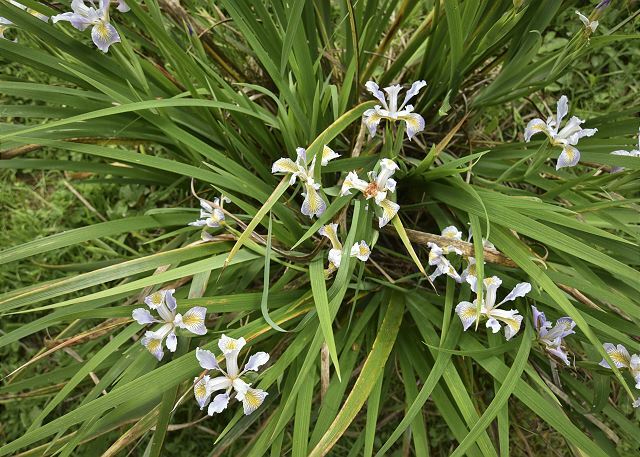 Iris growing in spring at Stylish Cabin. Just a short ride to the beach. Explore the many rivers and coastline by kayak. Lookout is great for bird watching! 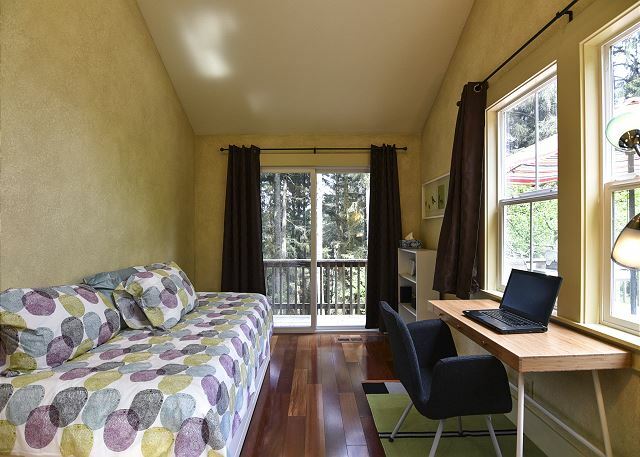 Stylish, Private Cabin on over 40 acres- A 10-minute drive to Redwoods National & State Park. Nice walking trails on the property and the whole space is very private. This is a wonderful getaway for a couple with children or two couples. 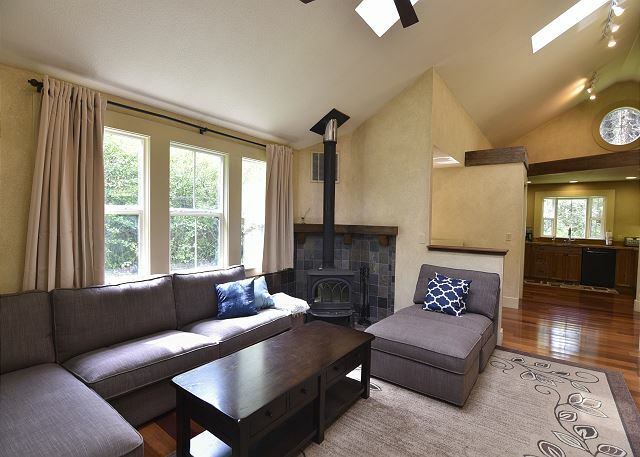 Enjoy the beautiful environment both inside this wonderfully restored home, as well as the fantastic wooded property which includes an outdoor seating where you can dine as well, and a fun firepit for the evening. The cabin sleeps 5; there 2 formal bedrooms, each with queen beds, and a third sleeping room. This location is perfect for that cabin in the woods feel. It is located in a very rural setting, within a mile of the highway. You immediately feel you are getting away from a busy life to a peaceful, quiet getaway the moment you turn off the highway. 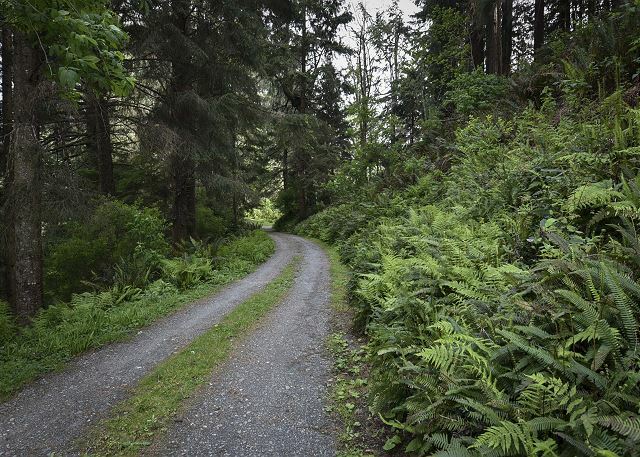 The road to the home is an upward winding and gravel road, lush with the canopy of trees and beautiful ferns along the way to the house. We highly recommend arriving during daylight for ease with finding the home, and an all-wheel drive vehicle during the winter months. 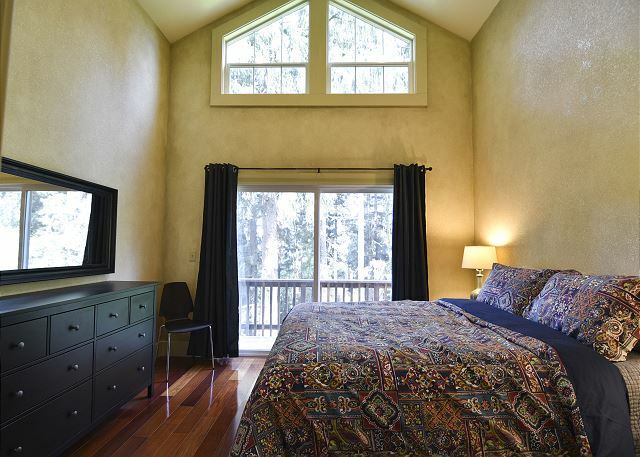 The home is in the redwoods, but with plenty of sunlight, and a very short ride to beaches, Redwood Parks & hiking, guided horseback riding tours, lagoons, and much more! Please see the information binder in the home for information on trails and hikes. 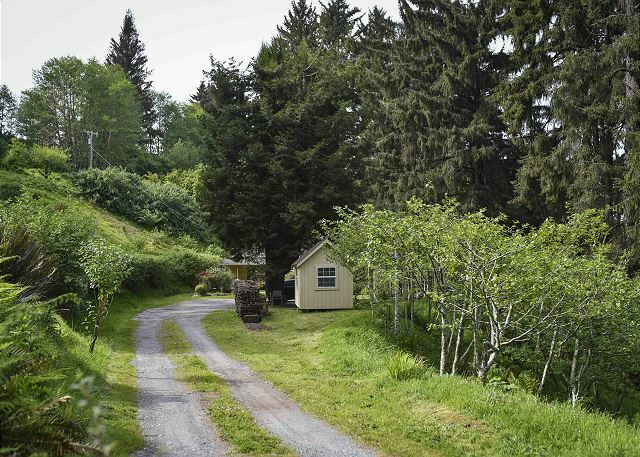 While there is plenty to do in the Orick area, and in the National and State Parks, and Lagoons, this home is roughly 20 miles north of scenic Trinidad, and about 40 miles north of Arcata, which boats of events during the summer months. Please note-There are exterior security cameras exterior of the house due to remote, rural area. No parties or events are permitted at this property. Wonderful Home. Extremely clean and modern. Beautiful grounds and great location for seeing all the redwoods and state parks in the area. Wood stove was nice as it was late October so fire was cozy. (there was regular heat as well if needed). No problems whatsoever. We arrived at night so tight, dark dirt road up to house was very exciting! I think the turn to the driveway is more like .6 miles from fork, directions said 1.5 but it was easy to find. Great place and the app for the phone from the rental company was also very nice. We stayed at the Stylish Cabin during our first trip to the Redwoods. It was a perfect central location to hit all the Redwood sights. Our family of four loved the cabin and were very much at home for our week stay. It has been wonderfully updated and full of great amenities such as new appliances, big screen TV with Roku, WiFi, and packed full of games for fun family game nights. The fire place added to the cabin feel. We would highly recommend this cabin for everyone wanting the perfect getaway in one of our country's most beautiful National Parks. Thank you!! Thank you for leaving such a wonderful review of the Stylish Cabin. 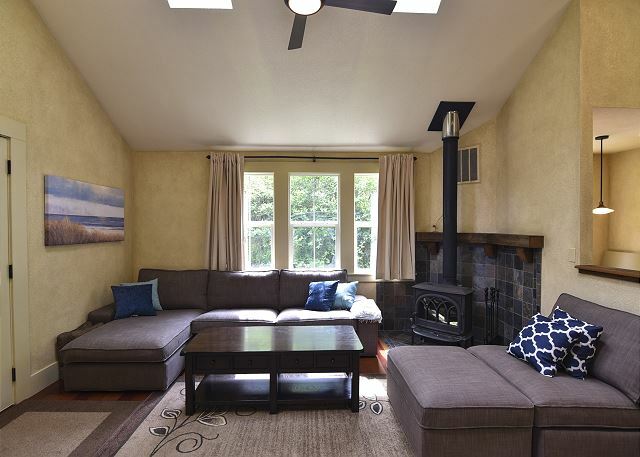 it sounds like this home was a good fit for you and your family for your first visit to the redwoods. What a great home to stay in, to get a feel of our north coast. Not only do we want our guests to enjoy the area, we do want them to be comfortable in the home, as well, and I am glad the home offered amenities for the whole family to enjoy. Please consider us again if visiting our area in the future. We would love to have you back. We stayed for four nights at the cabin and it was better than advertised. Amazing location on the very edge of the national park and just a few minutes from the Lady Bird Johnson, Trillium Falls and Tall Trees trails, as well as the visitor center at Prairie Creek. The house was very nicely renovated - new appliances, hardwood floors, lighting, etc., spotlessly clean and appointed with everything we might need for cooking utensils, grill, games, etc. Even DirecTV. Best of all, VERY secluded in the woods high above the valley floor - we felt entirely alone in the woods, with even a couple of redwoods on property. Awesome for our kids as well. We booked the cabin last minute due to yosemite fires and very happy we did - a truly memorable adventure! Highly recommended! I do not think there is more I can say, other than thank you for such a nice review. I love this cabin and I am always ticked when other people enjoy it, too. Sorry to hear you missed out on Yosemite, but love that you were able to come here to our neck of the woods and see what beauty lies beyond. Thank you for making us a part of your memories and I hope you will return again some day, to our little corner of the world. Perfect place to enjoy the redwoods! So glad the Stylish Cabin was loved and you found it to be a perfect place to enjoy in the redwoods. It is one of my favorite properties to visit and it always makes me smile to hear someone else appreciates the property, too. Thank you for choosing this home and for booking with Redwood Coast Vacation Rentals. Our family stayed at this cozy cabin for two nights as we toured the area. The owners do a great job of communicating with you before you arrive to be sure you don't have any questions. The description of this property is perfect. We thoroughly appreciated a break from hotel rooms and the noise of city locations. Thank you for making this home available to us! Thank you for taking the time to write a review of the Stylish Cabin. I am glad the home provided some elbow room and quiet time while on your vacation. 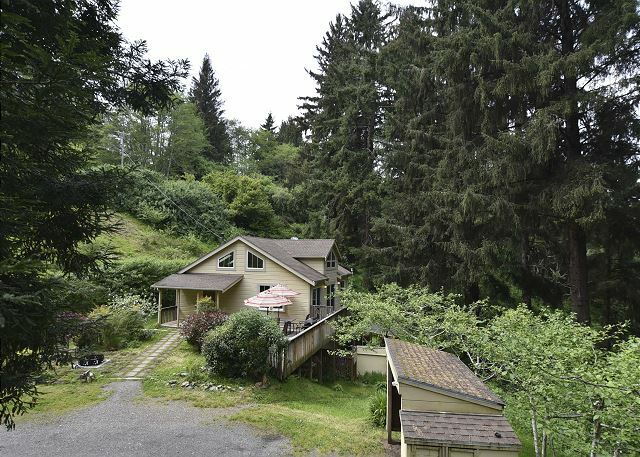 This is a lovely home set in the woods, yet close enough to the highway to go exploring the area if needed, which makes it a great escape from city life. We thank you for choosing this home and for booking with Redwood Coast Vacation Rentals. We hope you will make it back this way again soon. Great cabin in the middle of the woods. Total piece and quiet which is what we loved. Cabin was centrally located near all of the activity for hiking and site-seeing. We especially enjoyed the Lady Bird Johnson Grove and Fern Canyon. Stylish cabin is one of my favorite places to visit. It is very relaxing and beautiful. So glad to hear that you found total peace and quiet at the house, and that you visited two of the most beautiful places to see while visiting our area. Thank you for making us a part of your vacation and please visit us again soon. I've started in close to a dozen cabins in the Smokies. This is the most peaceful one yet, also in the top 3 for family friendly ease. I appreciated the camp fire wood and fire ring, and the family games. I was also impressed by the excellent maintenance and cleanliness of this place. I would definitely stay here again. Grab your supplies at supermarket an hour north or south of here, or expect to pay double at the local market in Orick. Also the directions they sent are good, but the first right fork right off the highway isn't mentioned, it's a private drive and could be confused as the road to this cabin. The Stylish Cabin is a great place to stay and I am happy to hear that it was enjoyed, and I hope you will return to stay here again if you visit this way again. As for shopping, yes, Orick is very limited. I highly recommend the beautiful drive to Trinidad, to Murphy's Market for any shopping. Thank you for the feedback on the directions, we will look into wording a little better. We rented the Stylish Cabin for 2 nights - my husband and 2 year old, and my parents. The cabin is very well appointed and was just right for our needs. I was surprised to find a Pack n Play available for our use, which was perfect, as my toddler is able to open doors and we didn't want him wandering unsupervised. We loved sitting by the fire ring outside looking for satellites. I greatly appreciate the communication and instructions regarding the cabin (although I had to Google instructions for the Fagor oven symbols, lol). The cabin is a short drive to the Redwoods National Park, which was our objective. We went to Trinidad for dinner one evening , which was about a 20 minute drive. Overall the cabin exceeded my expectations and I would certainly return. Our stay was wonderful. The furniture was comfortable and inviting. We saw elk in the morning and enjoyed sitting around the fire in the evening. It was a great location for sight-seeing too. We went hiking in the Redwood forest and tide pooling at the ocean. We spent one day just relaxing on the patio reading, playing games and watching the humming birds. Although the kitchen was well appointed, we went out almost every day to eat. I would definitely stay again and recommend it to my friends. My only suggestion would be to repave the first 100 yards of the access road/driveway. I love the Stylish Cabin and am so glad that you had such a wonderful time. 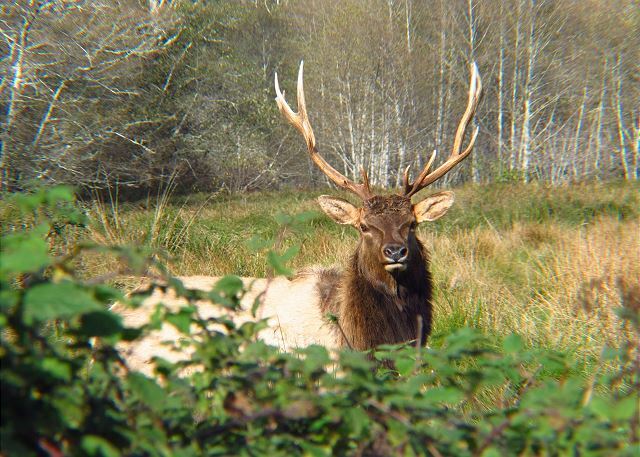 Elk, deer, and a multitude of other animals frequent this home, making it such a delight for guests, as well as myself. Thank you for choosing this home and for booking with Redwood Coast Vacation Rentals. I hope we have the opportunity to accommodate you again for future stays. It was a beautiful stay here. Very quiet and secluded. The kitchen had everything we needed and we would highly recommend this VRBO. The Stylish Cabin is truly one of my favorite homes. I love the location, quiet and peacefulness of the home. I am thrilled to hear you had a beautiful stay. Thank you for submitting a review and we look forward to the opportunity of being able to accommodate you again in the future. Thank you for recent stay at the Stylish Cabin and for choosing Redwood Coast Vacation Rentals. Wish we had stayed longer. Ideal location amid the Redwoods. Also, side benefit was a casino close by. Slight issue with WiFi that was rectified quite well by the management company. Clothes dryer needed to be cleaned, I am sure an oversight and as compensation we were able to have a late check-out. The house, location, and internal decor we're lovely, couldn't ask for more. Glad to hear you had a magnificent stay. The stylish Cabin is such a wonderful place to stay at when visiting our area. I am pleased to hear that the management team was able to help you and you enjoyed the house, location, and the décor. We do hope you will return to visit us again soon, and we look forward to accommodating you again. As a family of 5, staying here was nice ! We were looking to enjoy our vacation in a secluded area & this property hit the nail on the head ! Plenty of space for us to explore with the kids, fire pit for late afternoon fires, s’mores, roasted hot dogs ! Had everything we needed. Plenty of clean tasting tap water, nice fire stove, plenty of dimming lights, nice hot water for showers & plenty of windows to bring in the scenery ! The road to the property is bumpy, and the Management Comoany was efficient with any of our questions & needs ! We’ll be staying here again ! I am so glad you enjoyed your stay at the Stylish Cabin. 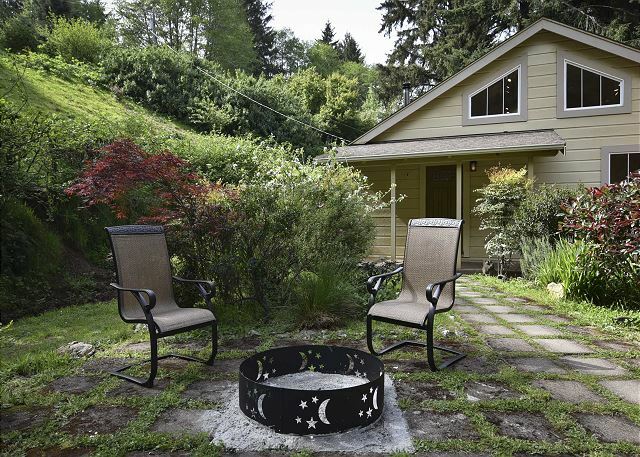 This is great home to stay in when you want to feel away from it all...fire, s'mores, and hot dogs...I wish I were invited, lol. It sounds like you had a great time while staying here, and it was a pleasure to speak with you on the phone. Thank you again, we look forward to your return. We all had a WONDERFUL time staying @ this cabin, it was so quiet, peaceful, & relaxing. We loved using the fireplace every evening & visiting with one another. The board games were a pleasant surprise & we really enjoyed those. It was also a relief to find that an instant hot water heater was present, since we have a teen who LOVES long, hot showers. It was a nice bonus to not worry about running out of hot water during your shower. Since it was fairly cold when we were there, the only thing we felt was missing were a couple of throws/blankets for the couch/living room area. Aside from that small thing it was amazing! The Stylish Cabin is one of my favorite homes. 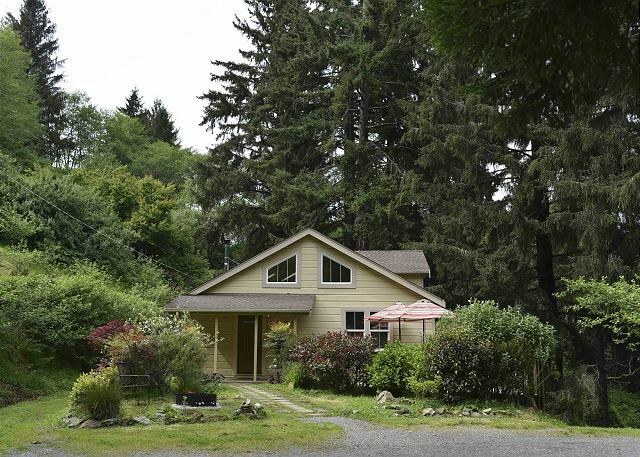 I love that it is nestled away in the wooded environment, yet so close to highway 101. I agree, peaceful & relaxing. There should have been throw blankets in the closets. Thank you for bringing to my attention, as I will make sure they are still there and get the home re-stocked, as needed. Thank you for choosing this home and for booking with Redwood Coast Vacation Rentals. We hope to see you again. Thank you for your recent stay at the Stylish Cabin. Great family rental. Very comfortable. Beautiful and remote. Thank you for your recent stay at the Stylsih Cabin. This is a very comfortable and great home. It sounds like it worked well for you for your stay. Thank you for choosing Redwood Coast Vacation Rentals. Beautiful home in beautiful setting! Thank you for choosing the Stylish Cabin. We hope you will return to visit us again, here on the north coast. WE had a wonderful experience at the Stylish Cabin. Everything about the property was as advertised and better. Unique property. Amazing location to the Redwood Parks. Pretty tough road getting to the cabin, but well worth it. Dori, the manager had to come to the cabin to work some technical issues, but was amazing! Called the owner and worked things out quickly. Loved it! Thank you for the great review and it was a pleasure meeting all of you. This Stylish Cabin is definitely one of my favorite places and I am pleased to hear you had a wonderful experience while staying here. Thank you for choosing Redwood Coast Vacation Rentals and please visit us again soon. I had a great stay here. The property has the most impressive stand of Douglas Firs I have ever seen. 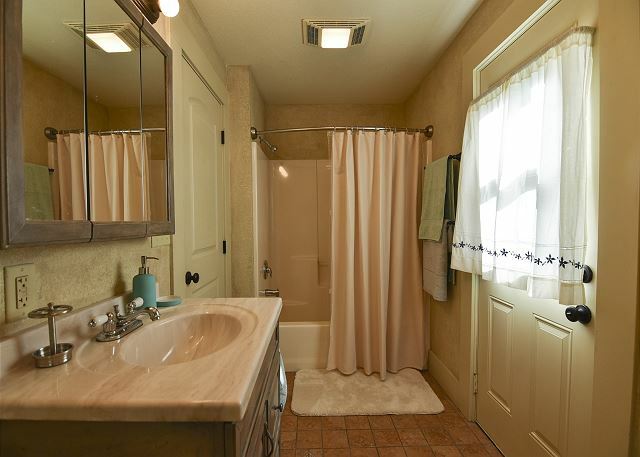 Large bath, plenty of towels. Fully equipped kitchen. House feels much bigger than the 1100 sq ft listed in the description, perhaps from the high ceilings. My only suggestion is to modernize the toilet - more power flush, oval, not round, bowl. Location is great - I went to many park trailheads, the coastal cliffs, and the lagoons all within a few miles of the cabin. I suggest doing your grocery run in town prior to arriving in Orick. Would def recommend. Stylish Cabin is such a wonderful rental. The environment is so lush and beautiful, there is so much to see and do nearby, and it is just such a comfortable place to stay. I am glad you had a great stay and hope you will return to visit again. We loved the appearance of the cabin in and out. We enjoyed how quiet and serene it was as well. 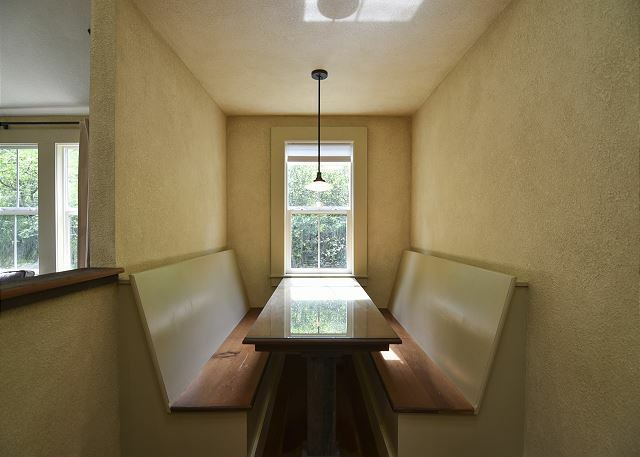 Only a few things stood out to us;the dining table is not 'plus size person friendly, the table did not move. Next, if you like a soft mattress you will love the ones they have, for my husband and I with our bad backs, they were too soft. The last couple of things would be the early -10:00am checkout and having to have the dishes washed and dried before we left, was a bit of a rush. Maybe, a later checkout and/or just filling the dishwasher and running it. We stayed at this cabin, myself, wife and 4 children and had a wonderful time. It is amazingly secluded and quiet. We loved having a fire and grilling smores every night. The house was very clean and supplied. One bedroom could use some more curtains if you have young kids because the sun doesn't set until very late in the summer. There is so much to do near Orick. I recommend the local horseback riding, it was great. Would definitely stay here again. It sounds the like the Stylish Cabin was a great fit for you and your family. I giggled a bit at your comment about the curtains in the kids room. We sill see what we can do about that. There really is so much to do in our area and I am glad to hear that you went horseback riding; I recently did this for the first time up into the Redwood National Forest. It was a blast. Thank you again for booking with Redwood Coast Vacation Rentals and we hope you will return to visit us again soon. hill above the house on our last day, what a treat. The Stylish Cabin is one of my favorite homes we have! I am so glad to read that you enjoyed it as well. Being off the beaten path and surrounded by nature is such a wonderful feeling and so relaxing. I am tickled that you saw a bear! I have never seen one just out in the wild, so that is such a treat! 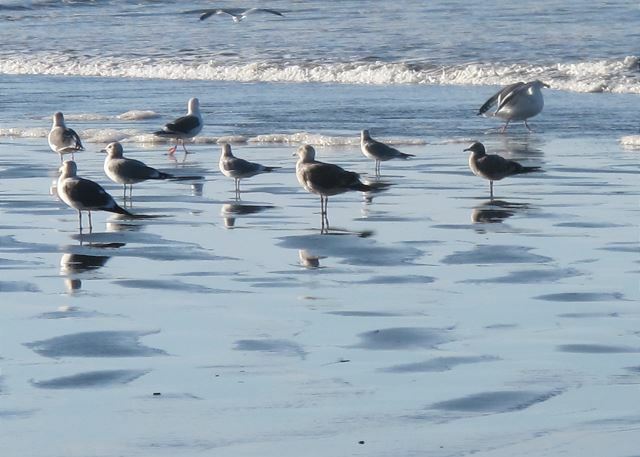 Thank you for booking with Redwood Coast Vacation Rentals; we hope you will return to visit us again soon. Amazing getaway that had it all!! Great location among beautiful big trees and so close to many great day trips. Some of our favorite excursions were to the corkscrew tree, Fern Canyon and The Lighthouse restaurant in Trinidad. Highly recommend this cozy cabin, we hope to return one day!!! 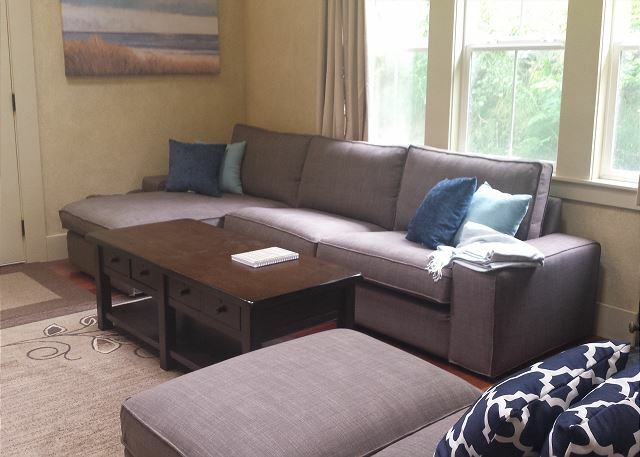 Thank you for the review Jennifer! The Stylish Cabin is one of my favorite homes, so glad that you liked it; and it sounds like you had some great excursions, too! We hope you will return to visit us again soon! Beautiful cabin on solitary plot provides a great opportunity to enjoy the Redwoods while getting away from it all. Very comfortable with amenities. I would stay here again! Good to hear you had a good stay. Stylish cabins is one of my favorite homes for the remote location and nature exploring. Thank you for booking with Redwood Coast Vacation Rentals and we look forward to accommodating you again. This property and home were magical and beyond ideal! 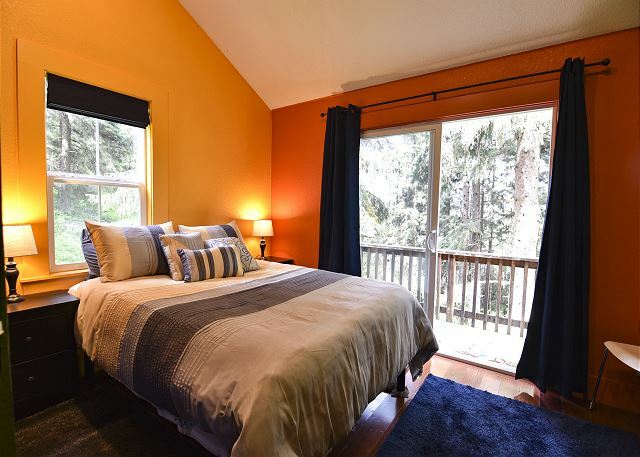 If you are keen to explore the Redwoods and enjoy your beach time, this home's location is simply perfect as getting to state and national Redwood parks, as well as local beaches was trivial. The VRBO home provided a quiet, serene, and remote wilderness experience - the perfect ending to day after day sightseeing and hiking. The only way the property could be any better would be by installing a hot tub to soothe those sore muscles at day's end. We will most certainly be back ourselves in the future. I love the Stylish Cabin; I am so glad that you had the perfect getaway while staying here. I love going to and from this property and it really is a serene place to stay. We very much look forward to accommodating you again in the future. Thank you for booking with Redwood Coast Vacation Rentals. Great location for visiting parks. Perfect for anyone looking for solitude. 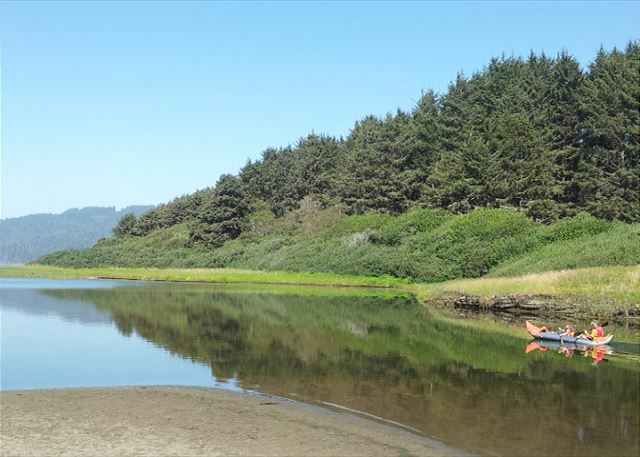 The Redwood National Park and Prairie Creek State Park are just a few miles away! House was clean and property management folks were easy and great to work with. The Stylish Cabin is one of my favorite places; I am so glad to hear that you enjoyed your time there and the proximity to the state parks. Thank you for booking with Redwood Coast Vacation Rentals and please visit us again soon. This was an incredible place to stay. Everyone absolutely loved it. The beds and bedding were beyond comfortable. The kitchen and family area was clean, modern, and comfortable. We just had an amazing time. I would recommend this place to anyone. We loved it! Very, very happy. Love to hear this! I love the Stylish Cabin, too! Nothing like being in the middle of nature, it is an incredible place to stay! Best Cabin experience ever!! Must go place! We stayed in this place for 2 nights and we absolutely loved it! The house is well tucked into forest to enjoy the nature with the comfort of all modern amenities inside. Also there are tons of places to visit nearby. We never wanted to leave after our stay. We would defiantly come back! All the things were well organized inside the house including tons of games and entertainment. So happy to read that this was the best cabin experience ever! I love the Stylish Cabin and it tickles me to hear others enjoy it, too. Thank you for sharing and I hope you will make it back to visit again soon! Very comfortable house in a beautiful location. We woke up a thanksgiving morning to see elk right outside the kitchen window. So glad you had a great Thanksgiving weekend at the Stylish Cabin. I really love this remote location, and what a treat to see the elks right outside the kitchen window! Nature at its best! Thank you for booking with Redwood Coast Vacation Rentals and we hope you will stay with us again. Wonderful space, inside and out. Would love to stay again. Thank you, Laura, for your recent stay at the Stylish Cabin. One of my favorite homes to enjoy. We would likewise love for you to return and visit again. Thank you. Such a fantastic stay. My fiancé had always wanted to see the Redwoods. Looked at a few lodging options and decided on this cabin. It was centrally located as to what we wanted to see on our one week vacation. We were extremely lucky with the weather. Being from the Seattle area, we were prepared for rain. It only rained the first 2 days we were there. After that clear skies and very manageable temperatures. We even spent an entire day on the beach in the sun. The cabin itself was awesome. Quiet and cozy after spending days hiking in the Redwoods. I would recommend spending a Redwood vacation at this location. The Stylish Cabin is such a treat to me, I am so happy to hear that you had a fantastic stay. What a cozy and romantic place to be in the rain for two days; and so glad you were able to enjoy our area on some sunny days, too. This quiet and cozy house is truly a special place. Thank you for choosing Redwood Coast Vacation Rentals for your vacation. The rental home was fantastic. Beautiful inside, beautiful outside. It was just ticked away in a little piece of Heaven. It was half way up a mountain and the drive was a bit hard to find, but it really was amazing. So glad you enjoyed the Stylish Cabin and congratulations on your wedding. Thank you for coming to our beautiful area for your honeymoon. We hope you will return to visit again or for a future anniversary. The home was nicer than I expected. The pictures don't do it justice. It was ver comfortable and nicely stocked. It was so quiet and peaceful and secluded. The little town of Orick is very quaint and everyone was helpful and friendly. If you rent this property you will not be disappointed. Thank you for this review of Stylish Cabin. One of my favorite places due to how quiet and secluded it is, yet not that far from Orick or Trinidad if you need anything or just want to go site-seeing. I am so pleased this cabin was nicer than expected. I hope you will be back to visit again soon. Wonderful! My only suggestion would be to leave some instructions for the media equipment. Glad you had a wonderful stay at the Stylish Cabin. Thank you for the suggestion on the media, will do! Great place to come home to after a day on the coast or the redwoods. Well stocked kitchen, comfy beds, strong WiFi if needed and quiet. Stars and fire pit amazing at night. Restful. Staff was great to deal with if any questions. The coffee and cookies an added treat. 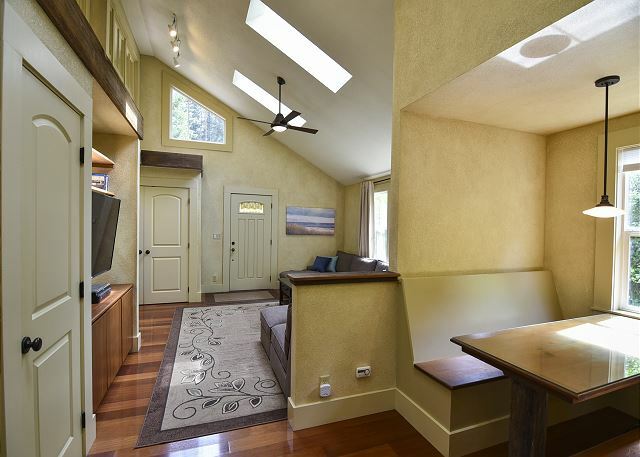 Thank you for choosing the Stylish Cabin and for booking with Redwood Coast Vacation Rentals. This cabin is such a delight to vacation at. 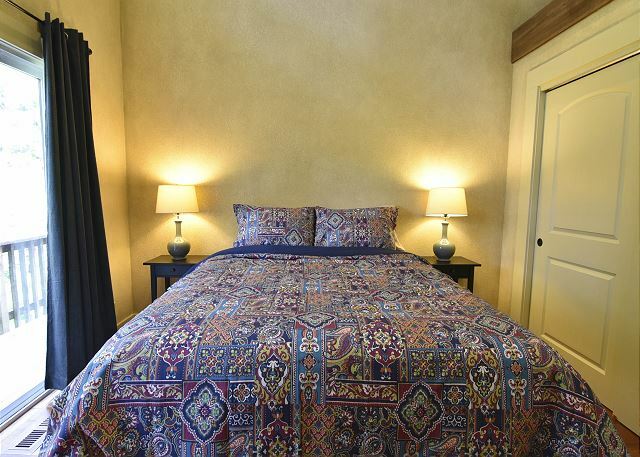 It is very quiet and comfy and in a great location for visiting the redwoods and our scenic north coast. We are glad you enjoyed the local treats. We hope we can accommodate you again in your future. This property was everything promised and more! this property was spotless! It was equipped with far more than expected. I will stay here again and highly recommend! Great review, thank you. Stylish cabin is a really neat place, one of my favorites. Thank you for staying with us and we can't wait to have you back! Overall a very nice place and would recommend the Stylish Cabin. Great location as it was close to all the hiking and beaches we wanted to visit but far enough off the beaten path for peace and tranquility. Newly renovated and it showed. Kitchen was well stocked and left us wanting nothing more. Those were the positives. Now the negative. Keeping in mind this is a rental, things will break, I get that. Where the ball was dropped was with the management company. We were 3 hours into our 6 hour drive up there (1p.m.) and I receive a text from the property management welcoming us to the property and to let us know that the dryer was broke and would not be fixed. Sorry for the inconvenience. Would have been nice to know this ahead of time so we could have packed accordingly. We were traveling with 2 kids and fully expected to be able to do laundry while up there. It would be one thing if it had just happened and there was no time to fix it, but upon reading the journal entries, it had been broken for at least a week and a half so they could have let us know in plenty of time to plan accordingly. No offer to compensate for the inconvenience. Not very good customer service. Stylish cabin is a lovely place and in such a beautiful part of our north coast. I am pleased to hear of the "positives" of what you found with the house. Unfortunately with any home, appliances often break and it is an unanticipated event, with the likelihood of immediate repair near impossible. Having to inform a guest a guest of something last minute is never what we hope to do, but unfortunately, the dryer did not arrive when we were informed and we didn't find out until midday. We do hope your time spent in our area was well, and that there were many other aspects of the home you were able to enjoy. Thank you for your stay. Nice property and location. Everything was good except that the clothes dryer didn't work. Myself and 3 fellow retirees had an absolutely fabulous time. 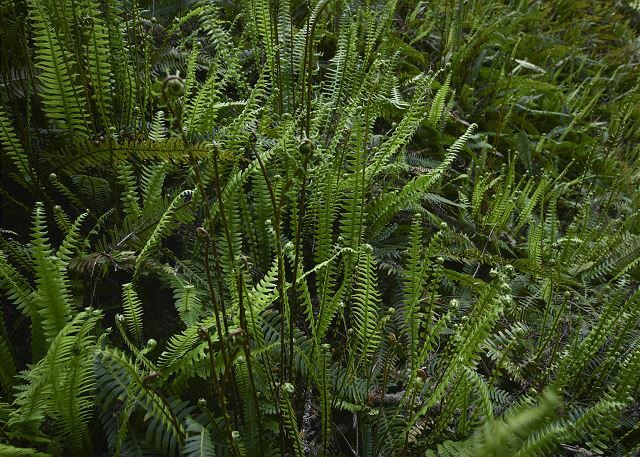 This property is like stepping into your own private forest. Beautiful,clean, up to date and functional. So many wonderful little touches that made our stay memorable. Made s'mores by the fire pit with butterflies and birds hovering around. Only a short distance to Trindad with lots to do and the walk through the Redwoods just a few mile north made our 4 days a very special retreat. What a great review of the Stylish Cabin. You couldn't have titled it better, Peace and Tranquility. We am so happy to hear that this home worked so well for you all. Thank you for staying with us and we hope you will visit us again. We enjoyed our stay in this lovely comfortable well-equipped cottage. 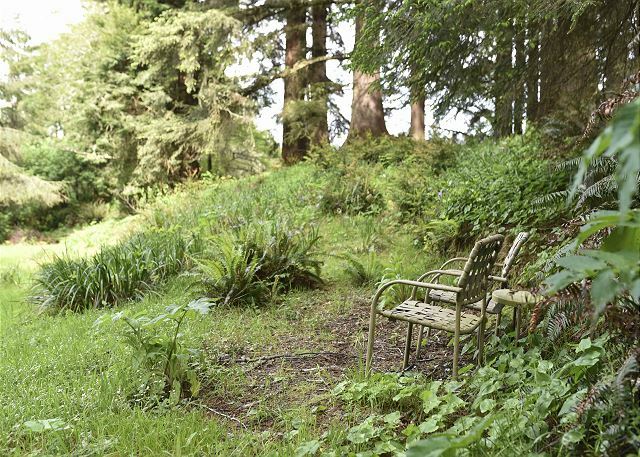 It was well situated in a lovely, sunny, plant filled clearing away from the main road and was close to the redwoods viewing locations that we were interested in. Shay, the property manager, checked in to be sure we had what we needed. This is one of our newer vacation rentals. Stylish cabin is quite lovely and we are pleased to hear you enjoyed your time there. 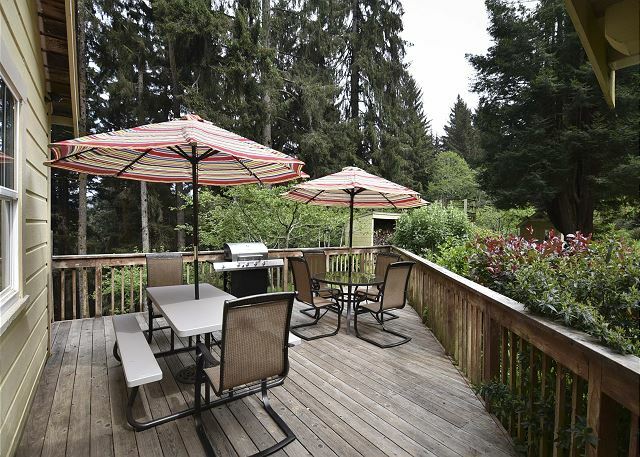 The home is well situated and the location is ideal for those visiting the redwoods and other local area attractions. Happy to hear Shay checked in with you, as that property is a bit off the beaten path; which is part of its allure. Thank you for choosing Redwood Coast Vacation Rentals and please visit us again. We had a good stay in this secluded cabin in the woods. The cabin was clean, comfortable, and well stocked with the necessities. We hope you enjoyed your time at the Stylish Cabin and thank you for choosing Redwood Coast Vacation Rentals for your rental needs! We hope you will visit again! We enjoyed all the comforts of home at this location. It is a perfect place to stay when visiting the Redwood Nation and State Forest. 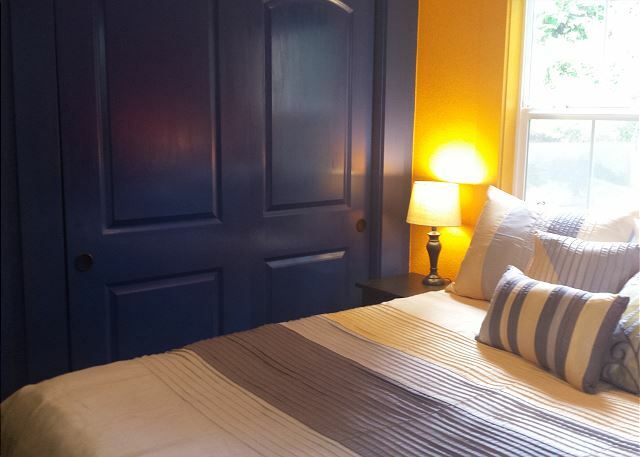 The property is very private and well maintained. The house is updated and has a great kitchen for cooking a family meal. 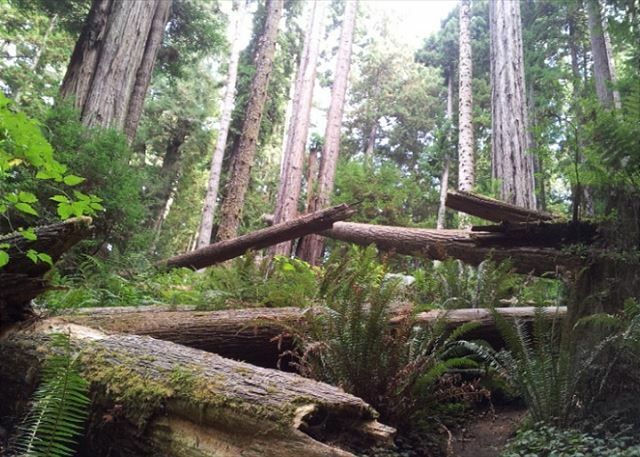 We would definitely recommend this location to anyone looking to visit here with family and explore the Redwood Forest. Great Oasis in the Redwoods! My wife and I wanted to get away for our 10 year anniversary and wanted some place secluded where we could rest and unwind. The Stylish Cabin was just that spot. We slept the best we have slept in years as it was super quiet and amazingly gorgeous. We enjoyed having breakfast on the patio each morning as well as watching movies by the fire at night. This was a great place and I hope to bring my whole family back sometime in the future! Quiet, clean, secluded... Just what we wanted. Sounds perfect! I am glad the Stylish Cabin was just what you wanted. Thank you for booking with Redwood Coast Vacation Rentals and please visit us again. Such a pleasant experience we had spending 3 nights here. They thought of everything- games for inside and out, big TV, fast wifi, comfortable living room, lots of towels, great knives as well as a great variety of dishes, pans, etc. Being recently restored, it was spotless and nicely decorated. there is a brand-new gas grill and plenty of nice outdoor furniture. we hiked around a bit- very nice- so quiet with the exception of the birds singing :-) very close to the beach and the Redwoods. there is a couple of little grocery stores in Orick but best to stock up before you get here- well worth the drive! The Redwood Coast Vacation Rental folks were always quick and helpful with their responses to my emails. Thank you so much for staying with us at our new cabin in the Redwoods and right near the Redwood National Park! 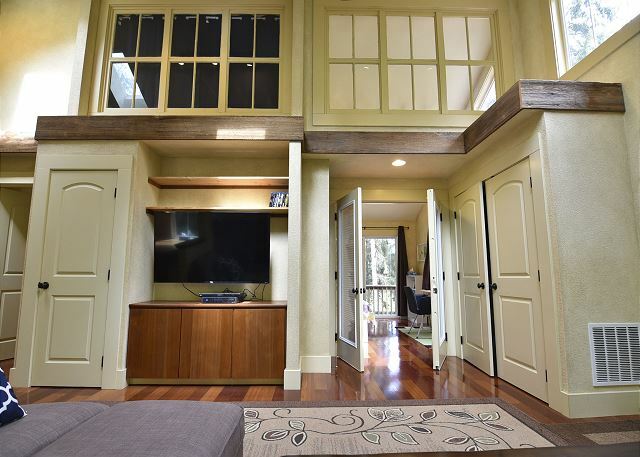 We hope you come back soon and really appreciate you noticing the details that went into making this cabin welcoming and enjoyable - from Redwood Coast Vacation Rentals with over 100 vacation homes from Crescent City to Ferndale including Trnidad, Arcata, Eureka, & this one in Orick!